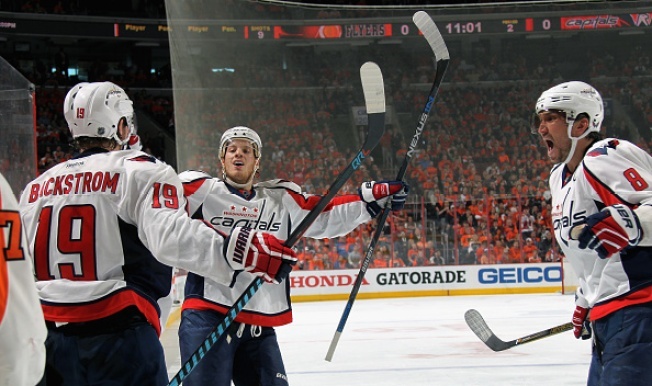 In a game filled with hitting, phantom penalty calls and great goaltending, the Washington Capitals beat the Philadelphia Flyers, 1-0, and advanced to the second round of the NHL Playoffs. After a scoreless first period where the Caps had a 5-on-3 power play and outshot the Flyers, 12-5, it took until the second period for Washington to beat Philadelphia Flyers goalie Michal Neuvirth. Caps All-Star Alex Ovechkin did a great job fighting off two flyers at the blue line to feed the puck to Marcus Johansson streaking down the middle. Johansson quickly got the puck to Nicklas Backstrom on the right wing, who roofed it past Neuvirth to break the scoreless tie. It was the first goal given up by Neuvirth in more than 70 shots on goal spread out over the past game plus. The Flyers peppered Caps goalie Braden Holtby, putting pressure on Washington in the final frame, but Holtby stood tall, preventing any shots from denting the net. The teams combined for more than 70 hits, each seeking to find a physical advantage over the other. Refereeing will be talked about in the coming days after Backstrom was tagged for a double minor high sticking penalty after Flyers Ryan White was hit in the nose and blooded by a stick. However, replays showed it was White’s teammate, and not Backstrom, who actually hit White. In the ensuing 4-minute power play, Caps Matt Niskanen was whistled for hooking. Once again, replays show Niskanen’s stick was on top, not under, the stick of Flyers forward Wayne Simmonds. The Capitals were successful in killing a 5-on-3 and 5-on-4 power play from the calls. The Caps will take on the Pittsburgh Penguins in the second round.